That trainer Bill Mott saddled Hidden Scroll for his debut on Jan. 26 — Pegasus World Cup day at Gulfstream Park — made for ideal timing with Joel Rosario in town to pick up the mount. Moving forward, it could also make for a tough decision. This, however, is a good problem to have for a jockey with the 2019 Kentucky Derby nearing. The Santa Anita Park-based Rosario, who also rides undefeated champion Game Winner, will return to Gulfstream Park for its March 2 card to pilot both Hidden Scroll in the Fountain of Youth (G2) and the Eclipse Award-winning filly Jaywalk in the Davona Dale (G2), agent Ron Anderson confirmed. Game Winner is expected to make his 3-year-old debut a week later in the March 9 San Felipe (G2). 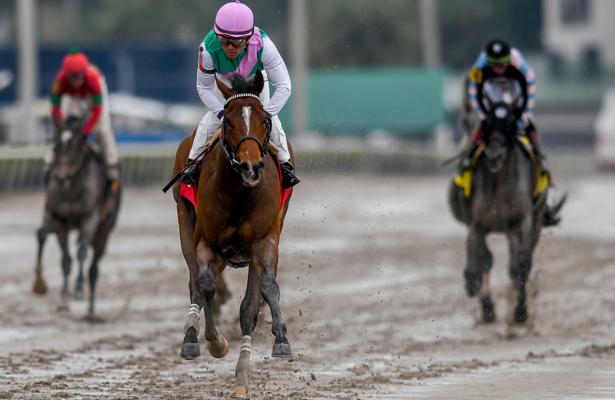 Should both Game Winner and Hidden Scroll progress to their respective final preps, there’s no conflict with the Florida Derby (G1) on March 30, a week before the April 6 Santa Anita Derby (G1). Typically, these choices sort themselves out. But just last year, jockey John Velazquez decided between Audible and Vino Rosso with both exiting major prep wins. He went with Vino Rosso, while Audible hit the board. It happens. Game Winner is already a three-time Grade 1 winner trained by Bob Baffert, who this year could tie the all-time mark with his sixth Kentucky Derby score. Mott, another Hall of Famer, is missing the Derby from his resume, but there's always the chance Hidden Scroll could materialize into the freak of a horse he appeared on debut. A Juddmonte Farms homebred by Hard Spun, Hidden Scroll, who won by 14 lengths and earned a 104 Beyer Speed Figure equaling Justify’s debut a year ago, will make his second start in what’s shaping up to be the deepest Derby prep so far this season. Graded stakes winners Signalman and Vekoma are poised for their respective 3-year-old debuts; Maximus Mischief will be coming second off the layoff; and Code of Honor and Mihos could have reasons to bounce back off their last efforts. Rosario, a 34-year-old from the Dominican Republic, won the 2013 Kentucky Derby on Orb weeks after riding Animal Kingdom to his Dubai World Cup victory. He’ll look for a similar stretch of success later this spring.